Graceful 17th century country manor home set in splendid countryside just one hour north of Rome. Ideally located for day trips to Rome, Umbria, Tuscany and Abruzzo. Elegant and Impressive, this villa was home to Julia Roberts and Family while filming EAT, PRAY, LOVE in Rome. Graceful 17th century country manor home set in splendid countryside just one hour north of Rome. Ideally located for exploring Lazio's Etruscan sites and Renaissance palaces or for a daytrip into Rome. Elegant and Impressive, this villa was home to a famous movie star while filming Eat, Love Pray. Villa Martino is a graceful 17th century country manor home, owned by the same family for three hundred years and has been designated as a national monument. Set in splendid countryside just one hour north of Rome, the villa is ideally located for exploring Lazio's Etruscan sites and Renaissance palaces, for golfing at one of several 18-hole courses or for a day in the city. San Martin al Cimino and the old city of Viterbo, are only one mile from the villa. There is a great deal to see within half an hour's drive: the unique gardens of the Villa Lante and Bomarzo, the over-the-top splendor of the Villa Farnese and beautiful old towns such as Vitorchiana and Montefiascone. As the center of the Etruscan civilization some 4000 years ago, the area is liberally sprinkled with their igloo-shaped tombs, notably at Cerveteri where the local museum houses an impressive collection of their extraordinary pottery. Newly renovated for 2009, Villa Martino has large rooms full of light and is decorated with fine antiques and a sprinkling of ancestral portraits. The bedrooms are immensely comfortable with modern bathrooms. 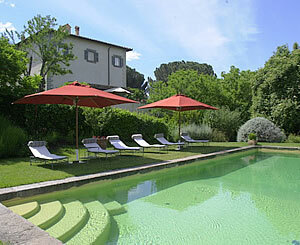 A few meters from the house is the beautifully restored guest house, La Casale. Outside, terraces and pergolas filled with flowers provide additional sitting and dining areas. A lawn with clipped hedges leads down through the garden to a stunning, infinity-edged swimming pool overlooking the estate's private olive groves and the hills leading towards Viterbo. There is a private chapel on the grounds making Villa Martino a perfect place for weddings. Simming pool is 14 x 7 meters / 46 feet by 23 feet set in a garden 20 yards from the villa, with an outdoor shower. The kitchen may only be used by the cook and staff at Villa Martino. The warm and gracious owners live on the premises.